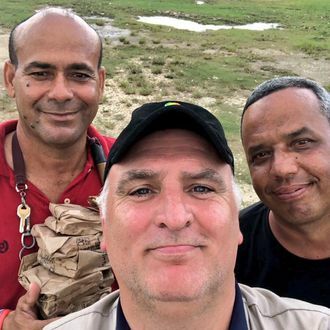 In recent days, Andrés’s team has done door-to-door deliveries, used the National Guard to distribute 400 meals in an area that got ten feet of floodwater, and endured bad weather of their own. Andrés also added this weekend that his World Central Kitchen group will have to scale back efforts in the near future, but he’s optimistic that the framework is in place so that no Puerto Rican will go hungry — in fact, he predicts enough volunteers have joined the #ChefsForPuertoRico cause that they’ll soon be cranking out 350,000 meals every couple days. “We’re going to do 200,000 meals a day, no problem,” he said in a video last night.